One of the more frequently asked questions is about trail etiquette, especially when it comes to the encounters between equestrians, mountain bikers, dog walkers? The Rangers’ usual reply involves an understanding of right of way and park rules. We will discuss these one at a time. Dallas Shewmaker of the Lower Gear store in Mesa, AZ explains right of way simply and directly. 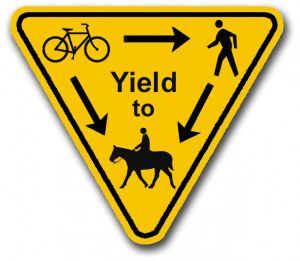 As suggested by the sign, horses have priority over both hikers and bike riders, and hikers have priority over bike riders. Horses aren’t as nimble as the other two, and take up a lot of space, so it makes sense for the others to give way to the lumbering giants. While doing so, make sure the horse can see you; that is, don’t step behind a tree or corner awaiting the horse(s) to pass, as that triggers a predator-in-hiding concern in the horse. Abide by any special instructions the horse rider may have – he knows his horse and how she might react to certain conditions. Even though the sign says that bike riders should give way to hikers, don’t count on it!! Apparently a lot of bike riders don’t know this and don’t see the signs. At least not the ones around our backpacking store in the Phoenix area! And in fairness, in most cases it’s probably easier for the hiker to get out of the way and let the rider barrel on through than have the rider stop, get off and then resume, especially if headed uphill at the time. I believe the guideline is there because the biker needs to be in control and be prepared to slow/stop so as to not run over hikers, which might happen more often if it was written the other way. Discretion is the better part of valor, so I usually let the biker through if there’s only room for one at a time, but if there’s a “wreck” between the hiker and biker, the biker would probably be held as the bad guy. And a side note to guys on bikes – if you come up on an isolated hiker from behind, probably lost in thought, don’t give him/her a heart attack by waiting until you’re about 5 feet behind and then yell “ON YOUR LEFT!!!”. Try it further back in a lower tone; we’ll still get out your way. Ranger Max would like to point out that there is more to trail etiquette than just right of way – there are park rules. The most important one concerns taking your dog with you when you are using the park. Ranger Max has encountered equestrians, bike riders, and hikers who take their dogs into the park with them. Park regulations require dogs to be on leashes everywhere within the park and for pet owners to remove their pet waste. Ranger Max, like most regular trail users, has encountered dozens of loose dogs on the trail. It seems that many dog owners choose not to use a leash and are seemingly oblivious to the environmental impacts and the fact that many folks simply don’t enjoy being pounced upon with muddy paws or being greeted by loudly barking dogs who may or may not be friendly, nor do they want dicey encounters between their own dog and another’s. Believe it or not, dogs off leash generate the most visitor complaints directed to park headquarters. Dog owners are famous for their excuses when rangers speak to them about their off leash pets-my dog is friendly; my dog is well trained and responds to my commands every time. Yeah, right. Rangers often encounter the loose shoe lace dodge. That’s when a dog owner spots a ranger and suddenly drops to one knee to quickly attach a leash to the dog’s collar while acting as though they’re re-tying a bootlace. Fools us every time. Well that is enough for this post. Trail ettiquette covers a wide range of topics from Leave No Trace to behaviors specific to each trail user-hiker, bike rider or equestrian. These are all good topics that Ranger Max plans to cover in future blogs. Take-a-way: Go enjoy the trails, and be thoughtful when you do, so we can preserve these wonderful public resources for us and future generations. And be sure to join and support local groups that maintain the trails you use. Local groups that support the Patapsco Valley State Park are the Patapsco Heritage Greenway and the Friends of the Patapsco Valley State Park. By nedtillman2 in Calls to action, Forests, Guest Post, Rivers on February 4, 2016 .